I wore a paycheck around my neck for more than 12 hours on Jan. 9. OK, so it wasn’t an actual paycheck. But it was a piece of paper worth one — with just some emblazoned details added. It was a ticket to the 2017 National College Football Championship. Why the Heck Would I Spend a Paycheck on a Football Game? Let me back up for a second: I’m a Clemson University graduate. Although I’m a native Floridian, my roots to the institution dig back to 1949, when my Papa graduated. I graduated 65 years after Papa, and haven’t been back to my beloved little South Carolina town since 2014. However, my blood still runs orange (it’s a Clemson thing), and I stay connected in many ways, including football — even though I’m totally not any other kind of sports fan. And this year, something big happened. 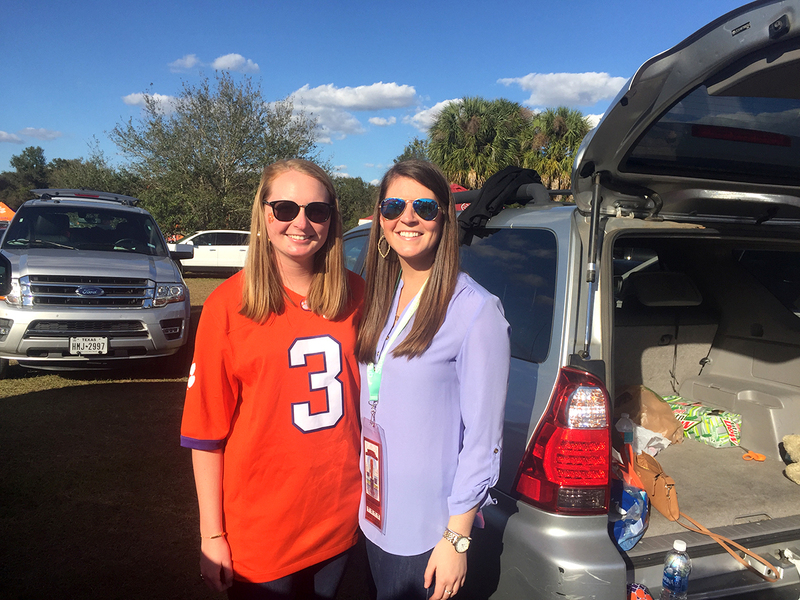 Clemson worked its way to the National Championship for a second year in a row — and was to face the University of Alabama again. And the game? It would be played 20 minutes away from my current location. As soon as I knew Clemson was in the game, I checked Stubhub for tickets. About $700. Before I continue, let me introduce myself to you real quick: I’m a Penny Hoarder. I’ve become fairly frugal since taking this job. I live at home, though I’ve saved enough to afford my own place at this point. I shop for days on end for plane tickets to find the best deal. I switched hairdressers and avoid eating out to save money. I even tried to stop using paper towels. So, no — I’m not the type to spend hundreds of dollars on a football ticket. I twiddled my thumbs the week leading up to the game. Certainly prices will go down, I rationalized. Wrong. Prices crept up. And up. And up. I told myself I’d be OK just taking the day off work and tailgating alongside friends and family — just being in the atmosphere would be enough. I didn’t want to spend more than $1,000 on a ticket, anyway. Heck, I didn’t want to spend $300. So, yes, tailgating was just fine. Finally, one of my best friends texted me: Let’s just do it. I sighed. Twist my arm. You know how there are five stages of grief? There has to be something like that for financial guilt. Leading up to the game, I started making a mental list of reasons why it was OK I basically threw away two weeks’ pay. I haven’t been back to Clemson since I graduated, which means I’ve saved a ton on plane tickets. And I don’t have to travel to get to the game — unlike last year, when it was in the freakin’ desert (Arizona). This could be the first time Clemson wins the national title since 1981 — since my Papa was alive. I’m living at home and have a good chunk of money saved and no pressing bills or loans to pay off. I can make this money back in two weeks. Even on the day of the game, as I stood in line for the porta-potty while tailgating, I talked with one of my cousins. Well, the way I see it…, I’d trail off. Well, I’m just not going to look at my bank account anytime soon…, I’d laugh. “You don’t need to justify it,” she said in such a matter-of-fact manner. I realized then — at those lovely, gag-inducing porta-potties — she’s right. I don’t need to justify my big purchase. After six hours of tailgating, I hiked to the stadium with my ticket still safely draped around my neck. I trekked up the steps to the upper deck. Way up. In the Alabama section. But, really, I was on top of the world with the most perfect view. It all gave me chills, and tears welled up in my eyes. I didn’t regret a thing. Even in the second quarter, when Alabama was ahead 14-0, I was still so happy to cheer on my team — in person. Each time we scored, I high-fived my best friend, my cousin, anyone around who’d take it. Then we won. With one second left on the clock. I couldn’t believe it. My mouth dropped, my hands went up, my voice cracked. I jumped up and down because that’s all I knew how to do in that moment. I’ll be the first one to tell you football is just a game. But this game and this experience meant so much more to me. It’s history. It’s pride. It’s my family. Sure, my team won. But even if we hadn’t, I’d still be grateful for the experience and the time I spent with my family and my friends whom I rarely see. Even today, nearly two weeks later, the video of the winning touchdown in the final second gives me chills, and tears threaten to well up in my eyes. That play — that entire game, and entire day — will stick with me forever. Even if we lost, I still wouldn’t regret my big, paycheck-sized purchase. I have no debt; I have no loans. I put it on my credit card — but only to get travel points. I’m not married, nor do I have kids. I’m totally selfish, and I’m OK with that. So, no, this essay won’t tell you when a big splurge is Penny Hoarder-approved. Nor will it tell you how to save up for your desired splurge. But, what I want to tell you is this: If you want to, and are able to splurge on something that means so much to you that it makes your heart swell — especially if it’s an unforgettable experience — don’t waste your time or nerves trying to justify it. Sometimes you just have to take a deep breath and live in that moment. Your Turn: Tell me about one of your big purchases.